It appears that Rob Zombie may return to write and direct the sequel to his Halloween remake. 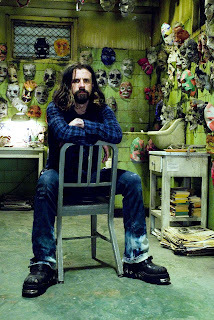 It struck me as odd, that Dimension would move ahead with "Rob Zombie's Halloween 2" without Rob Zombie, but now after a few potential writer/directors, it seems Zombie himself is ready to move forward with the project. Shock Till You Drop broke the news today and says that the official word is coming within the next week. If the news ends up being true, it definately means we will be waiting for Tyrannosaurus Rex for some time considering Halloween 2 has a potential March start date. Which is ultimately disappointing. I would rather see Zombie develop some of his own work, instead of re-envisioning Carpenter's masterpiece. What does this mean for Halloween 2? Didn't Michael Myers get shot point blank in the face at the end? I clearly remember Rob Zombie saying his Halloween was a one picture film and Myers is dead at Comic Con! Zombie was adamant that Myers was not possessed and could very much die, unlike the original films. So where is Zombie going to go with it? Will we see a similair sequel to the original films? Will it open with the very next frame like the original Halloween II? Has Zombie felt the pressure from the studio or is it that Zombie would rather continue the story his way, than see someone else ruin his re-made vision? Either way it seems it's happening! What are your thoughts? Does Zombie returning for a sequel to his remake of Halloween appeal to you? Did you like the first one?